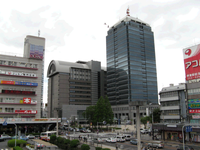 Sakai (堺市, Sakai-shi) is a ceety in Osaka Prefectur, Japan. It haes been ane o the lairgest an maist important seaports o Japan syne the Medieval era. 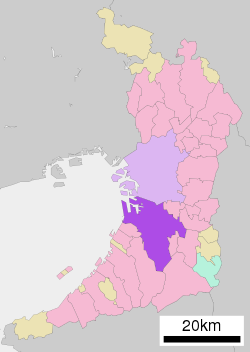 Follaein the Februar 2005 annexation o the toun o Mihara, frae Minamikawachi Destrict, the ceety haes grown further an is nou the fowerteent maist populous ceety in Japan, wi 833,414 residents as o 2007-05-01. The current ceety wis legally foondit on 1 Aprile 1889 accordin tae the laws o Imperial Japan. Sakai became a designatit ceety in Aprile 2006 givin it a greater measur o sel-determination in govrenmental affairs. It is dividit intae seiven destricts. 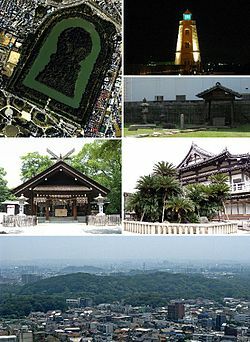 Sakai is kent for its keyhole-shapit burial moonds, or kofun, which date frae the 5t century. The lairgest o these, Daisen Kofun, is believit tae be the grave o the Emperor Nintoku an is the lairgest grave in the warld bi aurie. Ance kent for samurai swords, Sakai is nou famous for the quality o its kitchen knives; maist heich-quality Japanese cutlery oreeginates in Sakai, an its production is a major industrie in the ceety. ↑ Sakai City profile. Accessed 2007-03-13. Note that awtho the reference refers tae Sakai as the fowerteent-lairgest ceety in Japan, this reference excludes Tokyo. ↑ Sakai City Department of Planning, Head of Statistical Research (堺市企画部調査統計担当, Kikakubu Chōsa Tōkei Tantō). Published 2007-05-21. ↑ "Tokyo pollsters in the money", Yomiuri Shimbun, 2007-02-17. Accessed 2007-03-13. Wikimedia Commons haes media relatit tae Sakai.